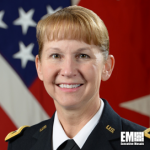 Maj. Gen. Patricia Frost is the director of cyber within the U.S. Army‘s Office of the Deputy Chief of Staff, G-3/5/7. Prior to her current role, Frost served as deputy commanding general for operations at the Army Cyber Command and Intelligence and Security Command as well as the military branch’s assistant chief of staff/G3. Her previous assignments include roles as platoon leader of the 8th Infantry Division in Wildflecken, Germany; commander of headquarters and operations company and battalion operations and intelligence officer of the 741st Military Intelligence Battalion at Fort Meade, Maryland; and intelligence training and security officer of the 82nd Airborne Division at Fort Bragg, North Carolina. She also supported Operation Enduring Freedom in Afghanistan and the Philippines as well as held the position of South Asia and Southeast Asia regional desk officer for the Pacific Command’s J2 Intelligence directorate. Additionally, she worked as deputy chief of initiatives group and director of executive engagements and services under the U.S. Army Pacific commanding general. Frost completed military intelligence officer basic and advanced courses at the Combined Arms Services and Staff School, Command and General Staff College and Army War College.